Rory McIlroy fired a second round 69 at the Australian Open to be one shot behind the leader and two-time champion Australian Greg Chalmers who fired a 66 to be at 5-under-par. 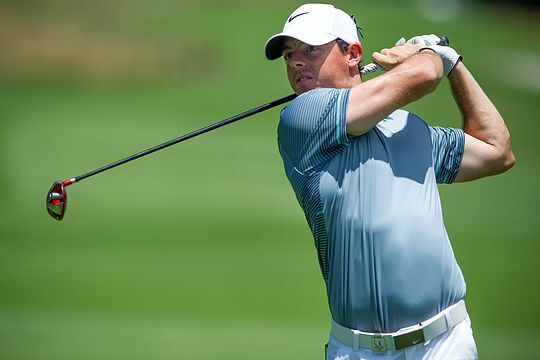 McIlroy went out at 1-over-par in a rollercoster opening nine, eventually making his move with an eagle on the 14th and closing with two birdies on the 17th and 18th. “I felt like I had an opportunity today to maybe shoot a good one and put a little bit of space between myself and the rest of the field,” said the world number one. McIlroy is currently in a tie for second position at 4-under-par, along with Adam Crawford, amateur Todd Sinnott and American Conrad Shindler. After an opening 3-over-par 74 yesterday left Adam Scott in danger of missing the halfway cut, the world number three bounced back in style to briefly hold the course record at the revamped layout. Scott fired a 66 which included an eagle and three birdies to revive his hopes of a second Australian Open title after raising the Stonehaven Cup in 2009. Scott is currently in a tie for 9th position at 2-under, three strokes from Chalmers. “We had a good morning for it so I had to take advantage just for the sake of getting myself back into the tournament,” Scott said. Masters runner-up Jordan Spieth was less than impressed after a clumsy marshal trod on his ball and potentially cost him the outright lead. The marshal’s mishap occurred after Spieth’s long iron tee shot rolled just over the back of the green on the par-3 fourth hole and into light rough. The marshal didn’t own up and it was left to spectators to alert Spieth to what had happened. Spieth recovered from the incident to be at 3-under and in a tie for 6th position, two strokes from leader Greg Chalmers. Geoff Drakeford and Brett Rumford are also at 3-under with Spieth. The round of the day went to American and former Eisenhower representative, Jamie Lovemark, who fired a 65 making five consecutive birdies on the inward nine to card a 30 after opening with a 35. Last week’s winner at the Australian Masters, Nick Cullen, backed up to finish even to make the weekend. The cut came in at 4-over-par with former Champion Geoff Ogilvy finishing one inside the mark at 3-under along with talented amateur Ryan Ruffels.